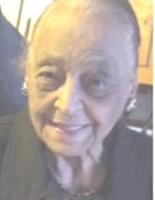 Provide comfort for the family of Lola Yates with a meaningful gesture of sympathy. Mrs. Lola Mae Davis Yates was born on June 30, 1921 to Ida Mary Davis. She accepted Christ at an early age and generously gave her time and talents partaking as: Church Musician, Sunday School Secretary, President of the Baptist Young People’s Union and ushered for 40 years at Toulminville-Warren Street United Methodist Church. Mother Yates had a special touch and as a care giver and helped many throughout the years. The domestic skills she acquired were graciously given to her family and those she loved. In addition to this, she worked for numerous years at Eckerds Drug Store and Chin Laundry. Mother Yates was preceded in death by three of her children: Frederick Yates, Amy Yates Cunningham, and Alphonse Yates. She leaves to cherish her memories seven loving children- George (Michiko) Yates, III of Palmdale, CA; Royal (Mattie) Yates of Fayetteville, GA; William (Barbara) Yates of Eight Mile, AL; Melvin Yates, Sr. of Milwaukee, WI; Alvin (Inez) Yates of Chesapeake, VA; and LeBarron Yates and Adrian Yates, both of Mobile, AL. Grandchildren– Dr. Johnny (Monrudee Osa) Yates of Honolulu, HA; Michael (Gina) Yates of Hubert, NC; Wonga Evans, Robert Cunningham, Stephen (Wanda) Cunningham all of Mobile, AL; Marsha Dawson of New Orleans, LA; Julia (Russell) Parker of Huntsville, AL; Shelia (Anthony) Nasario of Fayetteville, GA; Royal Yates, Jr. of Newman, GA; Kasimu Itep of Ruther Glen, VA; Charmaine (DeCarl) Yates-White of Birmingham, AL; Loreen Gage of Greenville, WI; Melvin (Nichole) Yates of Birmingham, AL; Alvin (Marja) Yates II of San Leandro, CA; Phillip Yates of Blacksburg, VA; Adrian Taylor, De’Aundre , Justin, and Kijal Yates all of Louisville, KY.
Great Grandchildren– Sgt. First Class Laferrel (Cornetia) Evans of Rockville, MD; LaDarius Evans of Mobile, AL; Marvin Nasario of Norcross, GA; Ashley Nasario of Orlando, FL; Robyn (Terrell) Petite, Rashad Cunningham, Christopher Peoples, Stephen Cunningham Jr., Kaelyn, Lauren, and Julian Cunningham all of Mobile, AL; JaWaun Dawson of Brent, AL; DeCarl, Jr. and Paityn White of Birmingham, AL ; Jasmine, Kennedy, and Leah Gage of Greenville, WI. Mother Yates memory is also cherished by 15 great, great grandchildren, 1 great, great, great grandchild, nephew and nieces- Sharon Yates of Baton Rouge, LA; Frank (Sheryl) Yates and Andretta Yates all of Mobile, AL; favorite cousins—Ruth Harris of Mobile, AL and Irene Davis of Fountain, AL; and lifelong friend Carrie James. To send flowers in memory of Lola Mae Yates, please visit our Heartfelt Sympathies Store. Provide comfort for the family of Lola Mae Yates by sending flowers.